Check out today's prep team spotlight on the St. Louis Catholic Saints who are trying to find their rhythm after a tough 1-4 start in the first five games of the season! 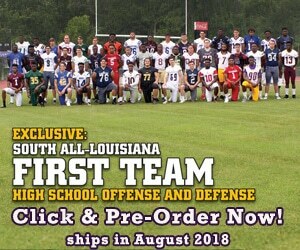 Check out today's prep team spotlight on the 4-1 John Ehret Patriots, which is a squad that possesses one of the most talented rosters in the state of Louisiana! Check out today's prep team spotlight on the Northwood Falcons who are starting off as strong as any team in the state with a 4-0 start and are looking to keep the momentum going forward! In today's prep team spotlight, we caught up with the Catholic Pointe Coupee Hornets, which is a team that is striving for excellence. Check out today's prep team spotlight on the Varnado Wildcats who are trying to get things clicking after an 0-4 start with their star player Adrian Bickham! In today's prep team spotlight, we caught up with the North Webster High School Knights! In today's prep team spotlight, we caught up with the St. Augustine Purple Knights who are riding into the week with an undefeated 3-0 record!